As indicated on the map, the results were very close with 51.2% in favour of prohibition and 48.8% opposed. 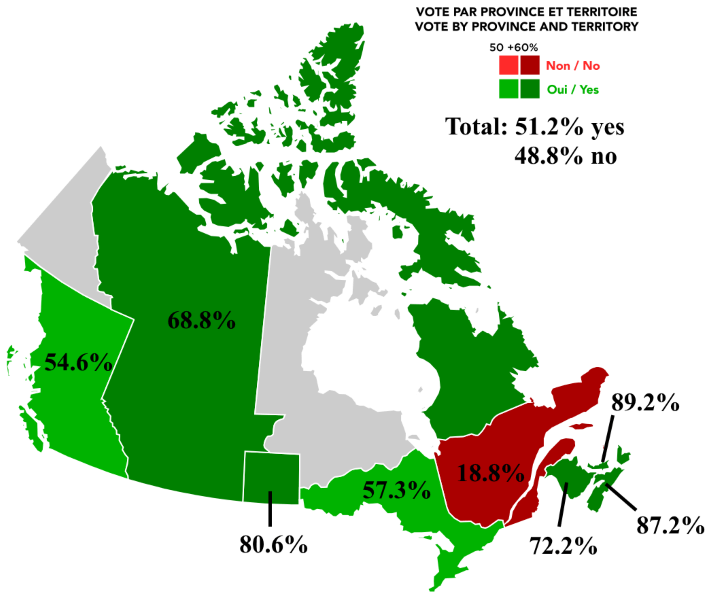 However, as can be seen, there was a dramatic difference between the results in Quebec, with only 18.8% support, and those in other parts of the country, which all registered clear majorities in favour. After much discussion the government chose not to act on the results. There were two main reasons for this. The first was the low turnout of only 44% (as compared with the 66% turnout in the 1896 federal election), which meant that less than a quarter of the population had actively indicated a desire for prohibition. Indeed, in many areas the whole exercise was conducted in a very low-key manner, especially in Quebec, and returning officers reported a considerable degree of voter apathy. The second reason was that imposing prohibition nationally risked splitting the country, given the sharp divide between French and English Canadians, so that it would be better to decide the issue on a province-by-province basis. A possible third reason was that the 1892 Royal Commission on the Liquor Traffic, which reported in 1895, had recommended by a four-to-one majority against national prohibition on the grounds that it was unrealistic. More detailed analysis of the results has indicated that support for prohibition was strongest among evangelical Protestants (Methodists, Presbyterians, Baptists and Congregationalists), who had spearheaded the temperance movement. In contrast, many Anglicans and Roman Catholics considered prohibition to be too extreme a measure. As the results clearly indicate, this was especially true among the French-Canadian population of Quebec. It being 1898, women were not able to vote in the referendum since women’s suffrage at the federal level in Canada was only granted in 1920. Since women were the mainstay of the temperance movement, the referendum would surely have been greatly energized and outcome might have been very different if they had been able to participate. And while women were excluded, in 1898 most provinces also applied significant restrictions on right to vote of Natives (aka Indians, as they were then termed). Following the referendum, the battle moved to the provincial level, but the prohibitionists only succeeded in Prince Edward Island, the smallest of the provinces, in 1902. However, prohibition was imposed on the entire country for much of the First World War. In 1918, following the termination of the War Measures Act, prohibition ended in Quebec but continued in the other provinces. In 1921 prohibition was overturned in British Columbia and between 1923 and 1929 was defeated in all the other provinces except Prince Edward Island, which held out until 1948. Those who are familiar with the political geography of Canada will have noticed that the number and configuration of the provinces and territories, as shown on the map, differs markedly from the situation today. In 1898, when the plebiscite was held, what are now Alberta and Saskatchewan were part of the North-West Territories. They did not become provinces until 1905. While Manitoba had gained provincial status in 1870, at the time of the referendum it was still restricted to a small rectangular area around Winnipeg. The map also shows Quebec and Ontario as missing some of their current lands to the north. In fact it was not until 1912 that Manitoba, Ontario and Quebec expanded to their present boundaries. Newfoundland and Labrador became part of the Canadian federation in 1949, while Nunavut was carved out of the Northwest Territories in 1999. Additionally, for some reason both the Yukon Territory (which had only been recognized as a separate entity a few months before the referendum) and the District of Keewatin (part of the North-West Territories at the time) appear on the map as if they were excluded from the referendum. Not sure why this might be the case or if, in fact, they were lumped in with the NWT. Ruth Dupré and Désiré Vencatachellum, Canadians and Prohibition: An Analysis of the 1898 Referendum, Preliminary Draft, March 2005.